The Habsburg Empire extended over, among others, Austria and Hungary at the end of the 19th century. This Salon Gourmet event will feature the multi-cultural heritage and flavours of the former empire. Chef Hans Luftenegger will bring to the table hearty Austrian-Hungary fare such as wiener schnitzel, an Austrian national dish comprising veal or pork cutlet. The menu will be paired with beers such as Hirter, one of the oldest Austrian beers. The Axis Bar & Lounge's daily Afternoon Tea features Asian tea blends including the signature Mandarin Oriental Singapore TWG green tea infused in ice jelly topped with citrus foam, alongside tuna sandwich with matcha spread, Emperor Sencha with salmon mousse with quail egg and caviar, bergamot dark chocolate gateaux, black tea passionfruit sable and oolong pear chocolate tart. Chef-owner Seita Nakahara, whose forte is transforming ingredients native to Japan into authentic Italian food, brings diners the flavours of winter with his Omakase, a chef's choice menu of his own creations. Offerings include Hokkaido sea urchin, Salfutu scallops, signature scampi, Kagoshima wagyu beef, Hokkaido mussels and Botan Ebi prawn. The set lunch features dishes such as oyster in leek soup, seafood linguine, grilled red snapper fillet, red-wine braised beef and avocado panna cotta. For $5++ more, diners can opt for a Daily Catch main - a seafood-of-the-day special. Chef Arnau Bosch, a third-generation chef from one-Michelin-starred Can Bosch restaurant in the coastal town of Cambrils, Spain, debuts next week as guest chef at La Brasserie, The Fullerton Bay Hotel Singapore. He will showcase his repertoire of seafaring creations, including Can Bosch's signature grilled octopus with cauliflower parmentier, emulsion of black garlic and capers, and fennel and parsley risotto with sea bass and coriander foam. The Gala Dinner on Feb 27 will feature wines from Spanish regions such as Valdubon and Castell Blanc, paired with a six-course degustation menu by chef Bosch. Japanese curry house CoCoIchibanya has introduced a new kids' meal menu with items such as Gyoza Curry, Omelette Mini Pork Cutlet, Hayashi (hashed beef) and Omelette Kinoko (creamed mushroom). The restaurant is also giving students a 15 per cent discount on weekdays between 3 and 6pm. On Wednesday and Thursday evenings, the Chihuly Lounge is offering unlimited servings of antipasti paired with wines, cocktails, draft beer and soft drinks. The traditional Italian antipasti selection includes prosciutto melon, hickory smoked salmon with caviar cream and a selection of cheeses and charcuterie. Ristorante & Bar is bringing Venice to Singapore with its Carnevale Veneziano Brunch, drawing inspiration from the historical annual Venetian masquerade festival. Diners can tuck into Venetian minestrone with borlotti beans and spaghetti. Those who prefer the fresh flavours of the sea can look forward to seared cod fillet with black gnocchi and artichoke mousse. A selection of antipasti will also be available. Plan an egg-citing hunt with Easter takeaways from Pacific Marketplace. Items range from the Mini Foiled Egg (150g for $12+) to the Dinosaur Egg (340g for $40) to the Giant Egg (1kg for $70+) filled with marshmallows. There are also assorted animal chocolates and mini egg chocolates (12 pieces for $24+) and the iconic Easter Bunny (110g for $15+) in the form of the Sitting Rabbit and the Laughing Bunny. Highlights of the new brunch menu include Egg Berentine with bonito flakes ($14++) that unites two classic brunch dishes at Australian chef Luke Mangan's restaurant - Eggs Benedict and Florentine. It combines poached eggs, chopped ham, spinach and homemade muffins with a dashi-infused Hollandaise sauce. 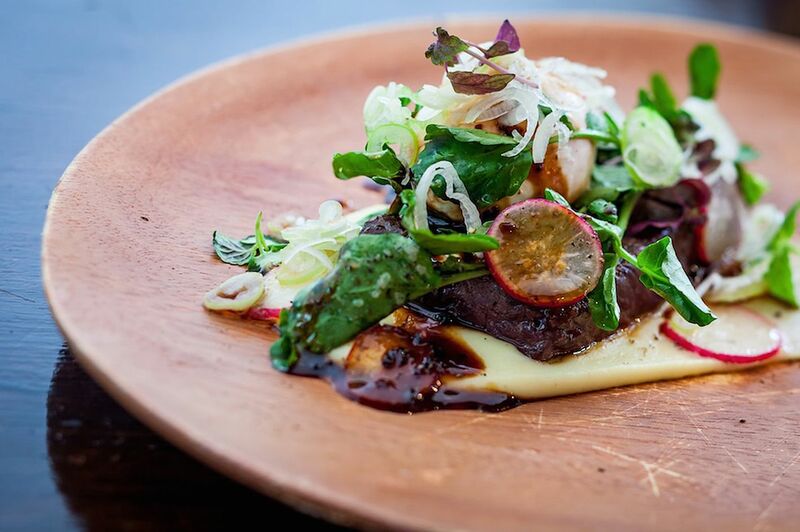 Others include the heartier Blackmore Wagyu minute steak with mash, watercress salad, poached egg and truffle dressing ($28++). The iconic Spanish cocktail takes the form of a Luke Mangan Sangria, which comprises brandy, Cointreau, orange juice, red wine and lime juice. Menu Swensen's has embarked on its Around The World In More Than 80 Days journey by releasing a different dish each month that is inspired by a country's culinary heritage. This month's Pineapple Fried Rice Paradise is inspired by Thailand. Enjoy Wahoo fish fillet coated with Swensen's version of sweet Thai sauce with fragrant pineapple rice. Next month will bring Essentially Hambagu, a Japanese take on hamburgers - freshly grounded beef mixed with sauteed shiitake mushrooms and grilled, then served with a specially concocted Japanese barbecue sauce. Chef Fung Chi Keung has introduced a Delicacies menu that harks back to his past, a reminder of the comforting home-cooked meals he relished when he was growing up in Hong Kong. Highlights include the appetiser of Braised Homemade Dace With Black Bean Sauce; Braised Chicken And Flower Crab; Wok-fried Garoupa Fillet With Spring Onions; and Grilled Pork Rib In Special Honey Pepper Sauce. Chef Drew Nocente launches a new Sunday brunch service from this weekend and describes the 5th Quarter Cava brunch menu as a mix of his favourite comfort brunch items. The menu will feature his Signature Chef's charcuterie platter, chorizo eggs, mushroom cappuccino, smoked maple bacon and apple, baked clams with garlic and fried chicken and pancakes. While most of these dishes are free-flow, there will be limited servings of the more premium ones such as grilled prawns and oysters. Head chef Marco Fregnan, from Treviso in northern Italy, is responsible for PerBacco's new menu that spotlights northern regional dishes. Examples include the classic Venetian Green Pea Risotto ($20++) featuring al dente premium Acquerello Carnaroli rice cooked in a vegetable broth with green pea puree and whole green peas finished with a drizzle of mint-infused oil; and milk-stewed codfish ($32++), which is cod fish slow-cooked in milk, onions and anchovies for 11/2 hours served with grilled polenta. This event features a five-course meal paired with six Rieslings from Selbach-Oster winery in Germany, along with guest speaker and winery owner Johannes Selbach. Dishes include crispy quail served with salad of apples, celery and walnuts; and veal shoulder white stew with bread dumplings and crispy skin pork belly and grilled farmer's sausage with braised red cabbage and baby potatoes.